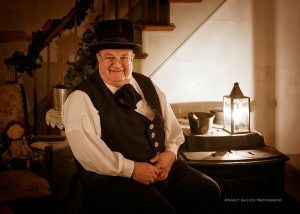 One of the best parts of visiting Hale & Farm Village, especially for children, is seeing the museum educators dressed in 19th century clothing. 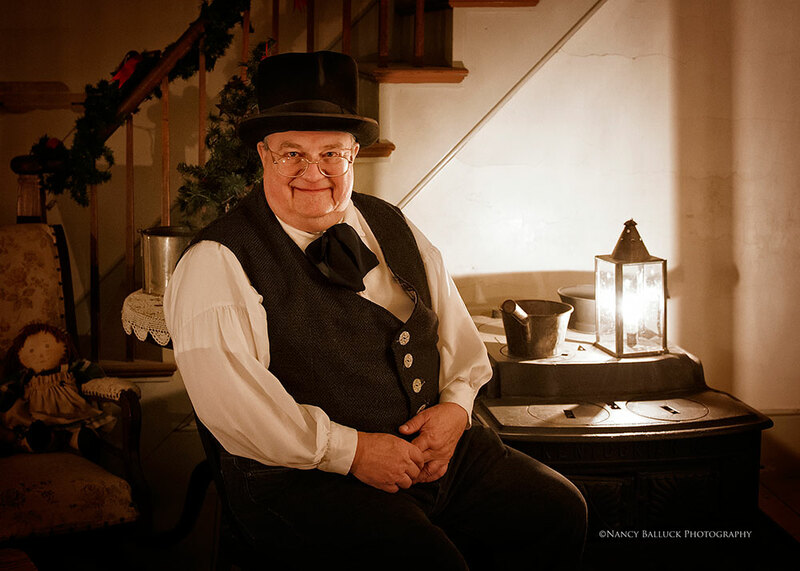 These men and women make the history experience real, whether they’re sweating through a blacksmith demonstration in the summer or trying to keep warm during a Holiday Lantern tour. 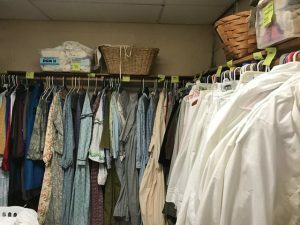 If you’re wondering what goes into the costume design and care, well, it’s a lot. A lot of team work, research, and planning. A lot of washing and mending. A lot of critical thinking about even the materials that were available to our 19th century friends in the Western Reserve. Jenna Langa is one of the museum educators tasked with the responsibility of sewing and maintaining the costumes used by the museum educators. While in college, Jenna worked in the theatre costume shop repairing and making costume pieces for shows. 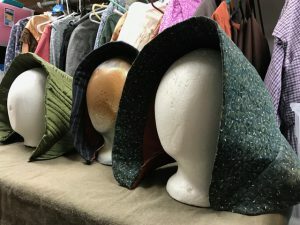 “I understand the inconvenience of uncomfortable costume pieces, whether (it’s) because of a missing button or a piece of hoop from the hoop skirt poking you during the day,” Jenna says. And while Hale Farm & Village has been closed to visitors in January and February, Jenna has been busy researching tailors and dressmakers of the mid-1800s and writing up an interpretation for the educators to use this year. She’s also been washing and repairing costumes in the museum’s collection that have been ripped or lost hooks or buttons during the past year. Some of the hoop skirts needed new metal wires to make the skirts look correct and be more comfortable to wear. The museum educators themselves are in charge of the maintenance of their costumes, but Jenna and educator Kirsten Fitzgerald are the point women who help them with repairs to the clothing they don’t know how to do themselves. Their detail work also includes helping the educators choose their costumes for the season so they fit correctly and are accurate for the sites where they’re demonstrating. One thing that will be different about the costuming this year is that the educators will have period-correct quilted winter hoods to help keep them warm. 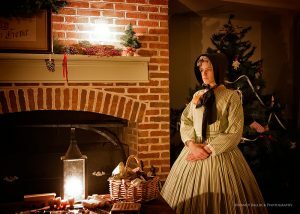 Amazingly, Jenna was able to teach herself quilting patterns from the historical record and produce 19th century hoods this off-season. What were the fashions of the day? What did different classes or occupations of people wear? 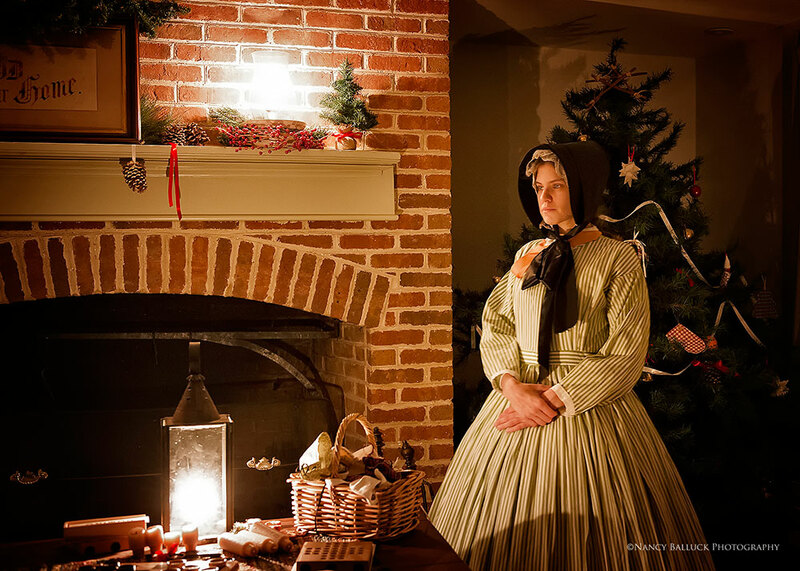 Did a pioneer woman bring to the frontier only the most serviceable clothing? Did our pioneer women develop a style of their own? In the village, what class should be highlighted? And what activity and year? If you’ve toured Hale Farm & Village recently, you may remember that the museum presents life from two important periods in Northeast Ohio’s history: pre-canal and post-canal. Lisa says the pre-canal era presentation looks beyond what a particular individual may have worn to what they would have brought with them, created, or acquired to wear that would have matched their circumstances. In the pre-canal era of 1810, fashion plates show high-style Regency in a woman’s gown with low-round neckline, high bodice, back closure tight-fitting sleeves, and a narrow skirt with a small train. Lisa says the staff believes frontier women likely found such fashions impractical. Much of the clothing answers are found in popular publications of the era, personal journals, or collections of surviving pieces. So in the village, for example, Hale Farm’s educators do not fixate on a particular year but share the story of daily life in a period of history. Hale Farm modifies a formal Regency style for pre-canal women with higher necklines, longer bodices, fuller sleeves skirts, and front closure, all for ease of wear. Accessories are used to improve an overall impression, where perfect historical accuracy is not attainable. Mid-century styles are “averaged” where possible, avoiding fashion extremes while highlighting general aspects of the wardrobe.